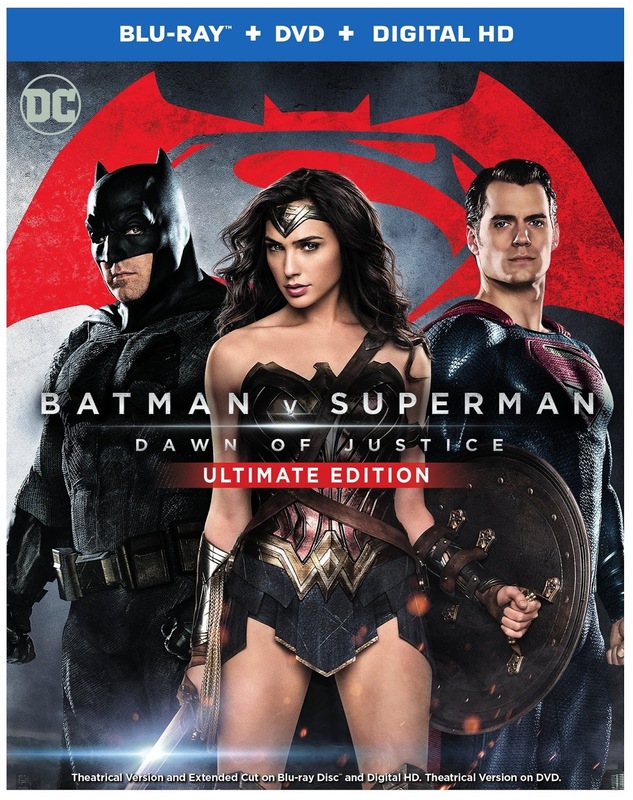 Something to Muse About: WBHE Announces "Batman v Superman: Dawn of Justice Ultimate Edition" on Ultra HD Blu-ray Combo Pack, Blu-ray 3D Combo Pack, Blu-ray Combo Pack or DVD on July 19 or Own It Early on Digital HD on June 28! WBHE Announces "Batman v Superman: Dawn of Justice Ultimate Edition" on Ultra HD Blu-ray Combo Pack, Blu-ray 3D Combo Pack, Blu-ray Combo Pack or DVD on July 19 or Own It Early on Digital HD on June 28! “Batman v Superman: Dawn of Justice” will be available on Ultra HD Blu-ray Combo Pack for $44.95, Blu-ray 3D Combo Pack for $44.95, Blu-ray Combo Pack for $35.99 and 2-disc DVD Special Edition for $28.98. The Ultra HD Blu-ray Combo Pack features an Ultra HD Blu-ray disc with the Ultimate Edition in 4K with HDR, a Blu-ray disc with the theatrical version and special features in HD, and Digital HD versions of both the Ultimate Edition and theatrical version.The Blu-ray 3D Combo Pack features the theatrical version of the film in 3D hi-definition and hi-definition, as well as the Ultimate Edition in hi-definition; the Blu-ray Combo Pack features the Ultimate Edition and theatrical version of the film in hi-definition on Blu-ray; and the DVD features the theatrical version in standard definition. The Blu-ray 3D Combo Pack and Blu-ray Combo Pack include digital versions of both the Ultimate Edition and theatrical version movies in Digital HD with UltraViolet*. Fans can also own “Batman v Superman: Dawn of Justice Ultimate Edition” via purchase from digital retailers. The film also stars Oscar nominees Amy Adams (“American Hustle,” “Man of Steel”) as Lois Lane, Jesse Eisenberg (“The Social Network”) as Lex Luthor, Diane Lane (“Unfaithful,” “Man of Steel”) as Martha Kent, and Laurence Fishburne (“What’s Love Got to Do with It,” “Man of Steel”) as Perry White; Oscar winners Jeremy Irons (“Reversal of Fortune”) as Alfred, and Holly Hunter (“The Piano”) as Senator Finch; and Gal Gadot (the “Fast and Furious” films) as Wonder Woman/Diana Prince. On June 28, “Batman v Superman: Dawn of Justice” will be available to own for streaming and download to watch anywhere in high definition and standard definition on favorite devices from select digital retailers including Amazon, CinemaNow, Flixster, iTunes, PlayStation, Vudu, Xbox and others. On July 19, “Batman v Superman: Dawn of Justice”will be made available digitally on Video On Demand services from cable and satellite providers, and on select gaming consoles. Theatrical Version Rating: Rated PG-13 for intense sequences of violence and action throughout, and some sensuality. Ultimate Edition Rating: Rated R for sequences of violence.